Lush green meadows upon which cows graze and geese cackle; trees heavily laden with fruit in the summer and fall, long tree-lined roads, and a picture-perfect castle standing atop the only large elevation in this otherwise flat countryside. 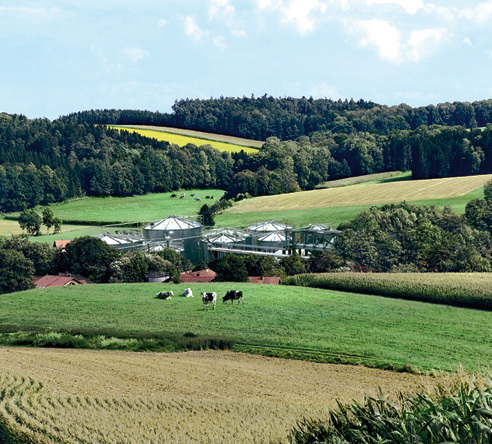 People who work here in Kleve truly have it good — if you like living in the country, that is. Ionel Constantin is one such person. This man with the somewhat thinning hair and brown leather jacket leads us along the grounds of Haus Riswick, a type of research farm operated by the Chamber of Agriculture of the German state of North Rhine-Westphalia in the middle of this picturesque landscape. 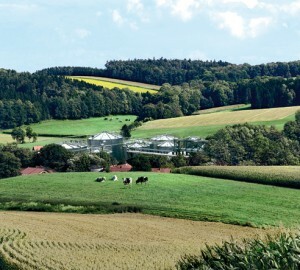 Here, in one of the westernmost parts of the Federal Republic of Germany, just a few kilometers from the Dutch border, you can catch an odour that smells like a mixture of fresh country air and the silage being used right now to feed well over 200 cattle housed in open stables. Constantin looks at the boxes in which the animals are almost silently munching the straw. Hardly a sound can be heard from the cows. Constantin is satisfied with what he sees. He moves on, and is suddenly standing in front of something that at first glance doesn’t seem to fit in with the idyllic surroundings. It’s an arrangement of six cylinder-shaped structures, each perhaps about five meters high. Two of them have conical roofs that make them vaguely reminiscent of giant African huts. In front of these stands a green building about the size of a two-car garage. From inside a low humming noise can be heard. “This is our biogas plant,” Constantin says. “The best cow in our barn,” he adds with a smile later. We, however, think of biogas and wrinkle our noses — but we can’t smell anything except for the soil, the silage, and damp leaves. That’s all. 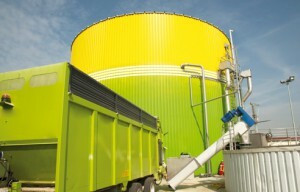 Green electricity is produced here: The round containers are part of a biogas plant. There is a huge amount of activity going on inside the two “huts”, however, which are actually fermenters — the facility’s reactors. 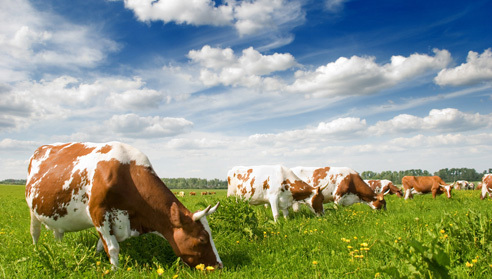 Biogas definitely offers the best example of how you can make money out of muck. That’s because the fermenters are “fed” every possible organic material you would expect to arise in an agricultural operation. Per day, the farm workers in Kleve put around one ton of left-over feed into the 578 cubic-meter container. They also add one to one-and-a-half tons of grass and corn silage and roughly five to six cubic meters of low-odor cow slurry. What comes out in the end is electricity — around 1,800 kWh is produced by the 75-kW plant each day. As if that weren’t enough, the facility also generates enough heat for the entire innovative site in Kleve. 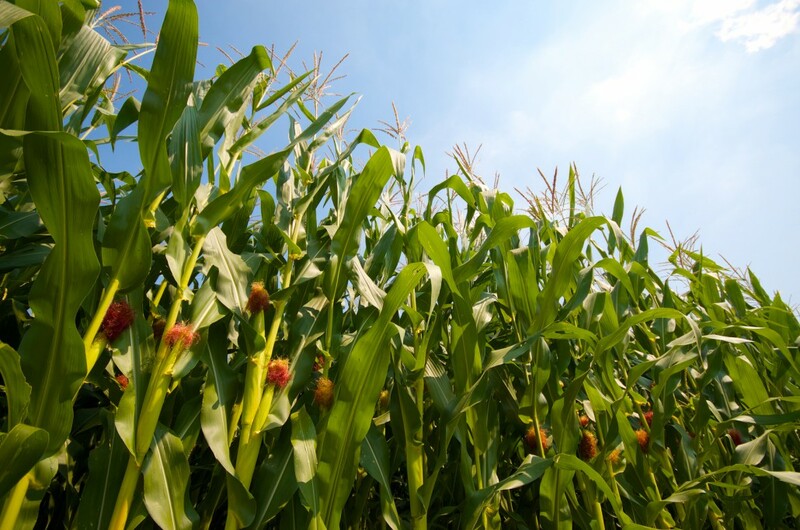 Fermenting plants such as corn produces the combustible gas methane, which can be used to drive an electricity generator. 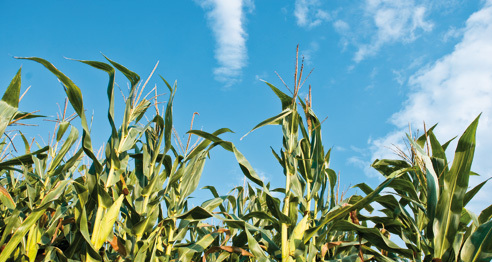 It’s easy to explain how a biogas plant works. First, bacteria in a slurry soup that has a temperature of 38 °C latch onto and consume everything that would otherwise rot in the open. The bacteria then excrete methane at the end of the metabolic process. Constantin shows us what can be done with that gas by opening the door to the mysterious green container. The low humming now sounds like the rattling of a tractor and there’s the slight odour of machine oil in the air. The container floor vibrates under our feet. “Methane is combustible,” Constantin explains. Indeed, the gas can be used instead of gasoline or diesel to run a combustion engine — which is exactly what it does in Kleve in an engine about the size of those found in trucks. This engine drives a generator that produces electricity. That’s basically the secret behind a biogas plant in a nutshell. Things are a little more complicated when it comes to the actual operation, though. As always, the devil is in the details, and the details here are to be found under the plastic screen of a small measuring device mounted next to the door of the container that holds the engine. “25 ppm”, Constantin says with a satisfied voice. “That’s a good value; things begin getting critical at 40 ppm. Gregor Hermanns, a technical customer consultant at the LANXESS specialty chemicals group that’s based in Leverkusen, Germany, is able to explain what Constantin means here: ppm, which stands for parts per million, is a measurement used in science and technology. Each part represents one one-millionth, just as one percent refers to one one-hundredth. In other words, ppm expresses the number of units of substance A per million units of substance B.
LANXESS chemists use a trick to eliminate the undesired hydrogen sulfide while it’s still in the fermenter’s bubbling slurry soup: They add to the slurry, silage and left-over feed a substance that the foul smelling gas likes to react with even more than with the metal in the gas engine — fine crystals of a mineral known as goethite. Chemically speaking, goethite is an iron oxide compound that quickly and easily turns into harmless iron sulfides when it comes into contact with hydrogen sulfide. The most prominent sulfide mineral to be found in nature is pyrite, which is also known as fool’s gold. In addition to using iron oxide to desulfurize biogas, LANXESS has developed iron oxide pigments for a wide variety of applications. The spectrum ranges from products for dyeing concrete and manufacturing airbags, brake pads, and catalytic converters to pigments for toners used in photocopiers and laser printers. The pigments can also be used as adsorber media for purifying drinking water or wastewater, for example. Bayoxide E 16 is a veritable blessing for operators of biogas plants because there were previously very few alternatives that were environmentally friendly, economical, clean, and, above all, safe. That’s a very important consideration, since the most inexpensive solution — pumping air into the fermenter so that bacteria can break down the gas into harmless sulfur — is not only inefficient because the biogas is diluted; it is also dangerous. “You can’t mix methane and oxygen because it could explode,” says Constantin. Some plants therefore dribbled small amounts of real goethite into the bubbling biomass brew. But whether the fermented residue really benefits the environment when it is subsequently spread on fields is very doubtful, to say the least. That’s because untreated ores sometimes contain heavy metals that should preferably not get into food. Stirring in solutions of iron salts wasn’t such a good idea either, because most of these solutions contain chlorine and are very corrosive. “And that’s even without taking into account the fact that aqueous solutions contain relatively little iron,” says Gregor Hermanns. “By contrast, Bayoxide E 16 powder consists of almost 60 percent iron, which means the concentration is much higher.” Another benefit is that Bayoxide E 16 is extremely easy to use. Farm workers merely have to dump a few bags of it into the fermenter feeder system. The paper bags dissolve over time so that expensive dosing systems are not required. Biogas is one of the key elements of Germany’s “energy transition.” The environmentally friendly method of generating electricity and gas in simple fermenters is gaining more and more adherents worldwide. By contrast, Constantin’s test facility used activated carbon for a long time in order to extract the gas with its annoying rotten eggs smell from the fermenter before it could cause any damage. The process was expensive and time-consuming, and required the filters to be replaced every four to six weeks. Although some activated carbon still has to be used with Bayoxide E 16, the latter “enables us to largely desulfurize the gas before the activated carbon is added,” says Constantin. And if you take the time and expense involved in using large amounts of activated carbon into account, it could very well be that Bayoxide E 16 is less expensive on the whole. It’s also likely that even less of the comparatively expensive activated carbon could be used if more artificial goethite from LANXESS were fed into the reactor. “We’ll test this theory soon,” says Constantin. So does biogas pay off for every farmer? “Yes,” replies Constantin immediately. “The technology is fully mature. Our plant was one of the first such systems in Germany when it went into operation in 2002. We didn’t have much experience at the time, so we have since carried out many experiments. Our plant amortized itself long ago and now generates a profit.” In principle, anyone who has a sufficiently large farm and enough capital to cover about half of the investment costs can operate a biogas facility, states Constantin. 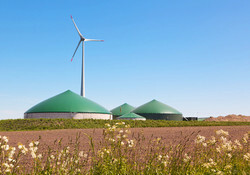 Many people have come to a similar conclusion, which is why the number of biogas plants has increased tenfold in Germany over the past 13 years. 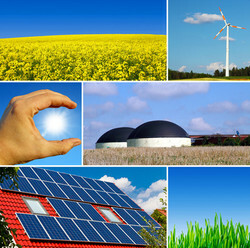 As a result, biogas-powered engines fed almost 3,000 megawatts of electricity into the German grid in 2011 — the equivalent of two large nuclear power plants. The technology is also becoming increasingly popular elsewhere in the world, where it’s used in both small-scale and large-scale applications. China and India, for example, already operate megawatt-scale biogas plants that are almost CO2-neutral, while some families in Cambodia use small, household fermenters to produce gas for cooking. In fact, a farmer only needs 500 chickens to get enough waste to operate a small biogas facility measuring a few cubic meters in volume. Constantin says goodbye. The engine in the green container continues to hum softly. The cattle in the super-clean cowsheds nearby have finished eating. Constantin will later use any remaining animal feed to generate electricity. We take a final whiff of the air. Do we smell hydrogen sulfide or rotten eggs? No, not at all. Just plain country air and the scent of moist earth. Fast, Colorful, And Economical Water!